From a time when even the residential properties on Wilson had taverns. Today's daily search for images uncovered this gem. 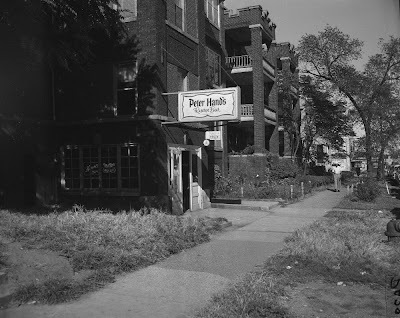 Pete Hand's Saloon was located on Wilson. Unfortunately, the photo doesn't include the address; it merely states that it's in Uptown. Does anyone recognize the building? Not sure, but is this the south side of Wilson on the block between Clark and Dover? I think I figured it out Joanne! This building is the only small residential building standing on the northside of Wilson between Hazel and Clarendon. Off in the distance you can see the building (the white ornate terracotta building) that stood at Wilson and Clarendon. I figured it out from Google Street View and comparing this building to the one that still stands. Peter Hands was a Chicago beer company years ago. Not sure what the bar name is here though. Seriously, what would we ever do without Google street views? I'll check it out. @UU -- Thanks for the links from FB; love when you guys link from there. You can even see the little detail above the windows on the building on Street View. It's a pity that all the building to the east of this were razed. You can also see the "W" in the "Bulldog and Whistle" that stood at Wilson and Clarendon in the distance. Yep, the fire hydrant is still in the same place! @UU -- Ah, the Bulldog and Whistle. That's one building I wish had survived. For those of you who haven't seen it yet, visit Bulldog and Whistle. I'll have to post about it on the blog sometime. If anyone has photos of the building across the street, please share. From aerial photos it looks like there once was a very large building where that empty lot is now. I also think that was where Via Lago was located, but I'm not sure. If someone could find out I'd really appreciate it. Via Lago was at 835 / 837 Wilson. We do have a few postcard images of the interior, and an early restaurant review for it. And I just posted an image of a matchbook. You can find them all here: Via Lago. I'm still searching for exterior views.